At the end of our last article, I had just finished rebuilding the mowing deck with new bearings. This was my attempt to lower the amperage draw of the mowing deck. Lower amperage means smaller batteries or longer run times which was my main concern. Thankfully, Ben Nelson came to my aid again. A few days ago, he lent me a couple of his batteries. These are group 31 100Ah gel cell batteries. They aren’t in great condition, but would be very similar to the batteries I had been thinking about using. 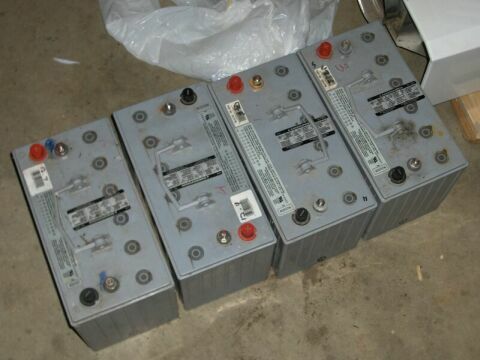 These are big batteries and weigh in at about 70 lbs each. The first test I did was only with two batteries. 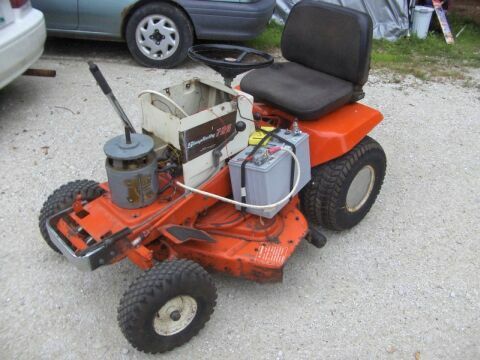 This 24V test let me know that 24V just isn’t enough power to cut with my mower. The motor slowed way down and the blades just wouldn’t spin fast enough. I did this just to get a feel for how other voltages worked out on the mower. The driving speed at 24V was just right, so I should be able to size my drive pulley for any other voltage. The second test I did with three batteries or 36V. I know it looks funny, but its what I had on hand at the time and it is just for testing. This test went off great. The pulleys are still over sized, so amperage draw is probably a bit higher than it normally would be. Anyway, with this setup I was driving around at around 10-20A. Engaging the mowing deck this time around only increase amperage pull by another 25A! The rebuild was a complete success and dropped the mowing deck amperage draw by 66%! 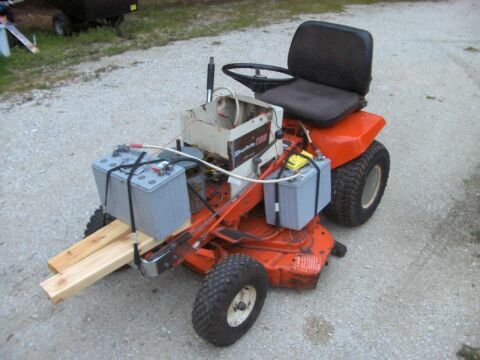 Continuing on with testing, when cutting grass and moving at a normal cutting speed, it was pulling around 50-75A. This is the realistic load I was after. This is the number that I will size the battery pack for.